Is it safer to fly or take the train? How dangerous is skydiving? And is eating that extra sausage going to kill you? We've all heard the statistics for risky activities, but what do they mean in the real world? 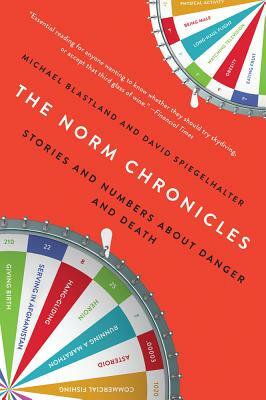 In The Norm Chronicles, journalist Michael Blastland and risk expert David Spiegelhalter explore these questions through the stories of average Norm and an ingenious measurement called the MicroMort-a one in a million chance of dying. They reveal why general anesthesia is as dangerous as a parachute jump, giving birth in the US is nearly twice as risky as in the UK, and that the radiation from eating a banana shaves 3 seconds off your life. An entertaining guide to the statistics of personal risk, The Norm Chronicles will enlighten anyone who has ever worried about the dangers we encounter in our daily lives. Michael Blastland is an author, journalist, and BBC Radio 4 broadcaster. He is the author of, with Andrew Dilnot, the popular math books The Tiger that Isn't and The Numbers Game, as well as the memoir The Only Boy in the World. David Spiegelhalter, OBE, is Winton Professor of the Public Understanding of Risk in the Statistical Laboratory, University of Cambridge. He is a fellow of Churchill College, Cambridge, and the Royal Society.